Vicki Beebe, a Community Services liaison for the St. Paul Regional Labor Federation, assisted Letter Carrier Jon Denardo to unload his truck outside the Neighbors Inc. food shelf in South St. Paul. Union Letter Carriers delivered for food shelves and families in need across the Twin Cities Metro Area May 10, collecting over 1 million pounds of food donated by people along their mail routes. The National Association of Letter Carriers’ annual Stamp Out Hunger food drive is the nation’s largest one-day food drive, which celebrated its 22nd year in 2014. 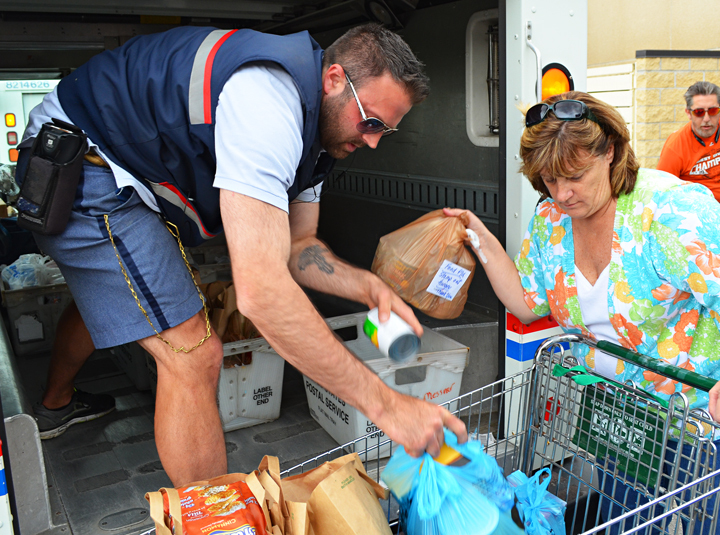 Letter Carriers from Minneapolis and St. Paul combined to collect 774,892 pounds of food May 10. Cash donations from the area amounted to $61,456, which will purchase 286,552 additional pounds of food, NALC Branch 28 member Perry Schmidt, a longtime food drive volunteer, reported. The total count for the Twin Cities, then, was 1,051,444 pounds of food to help stock the pantries of Second Harvest Heartland and other local food shelves. Stamp Out Hunger has become a day of service not only for Letter Carriers, but for volunteers across the community, including many union members. Volunteers staff distribution sites, helping carriers unload donations from their trucks. Claudia Espino, a member of St. Paul Letter Carriers Branch 28, dropped off food at the distribution site in Sun Ray Cub Foods’ parking lot.